“Historically, the cost of buying a house has been positively correlated with the percent of households that own their home. During 1996 to 2006 in the United States, both the price of houses and the homeownership rate increased. This increasing trend ended abruptly with the global financial crisis, which saw house prices plunge and drove homeownership rates to historically low levels. 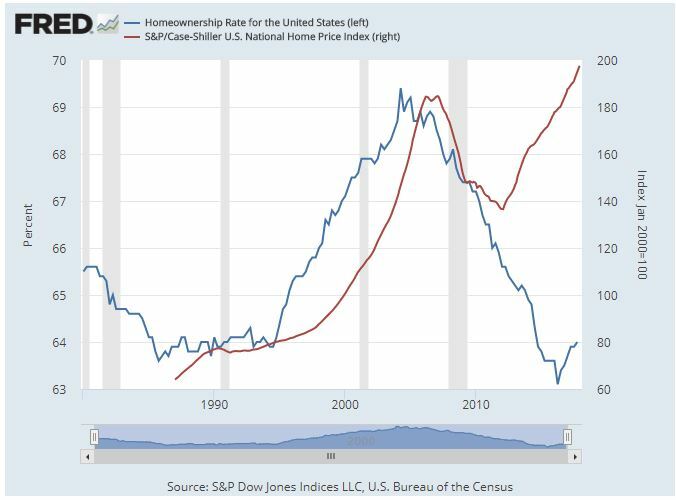 If homeownership became less attractive in the wake of the financial crisis, we might expect both prices and homeownership to decrease. Similarly, if the current increase in house prices were driven by people buying homes to live in, we might expect the homeownership rate to increase along with prices. However, recent evidence shows that house prices and homeownership are diverging.